We at the Theodore Roosevelt Medora Foundation are proud to support the independently-produced Dakota Datebook segments done in cooperation by Prairie Public Broadcasting, TR Repriser and historian, Steve Stark, and the North Dakota Humanities Council. 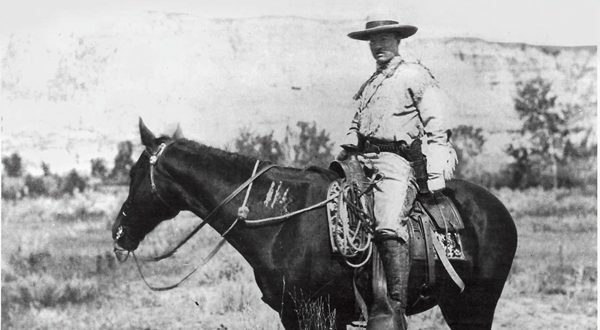 Theodore Roosevelt was one of the most influential and iconic Presidents in the history of the United States — and he believed that he would not have reached the heights he did, had it not been for his time here, in the Badlands of North Dakota. Enjoy these weekly podcast installments shared with permission from our friends at Prairie Public Broadcasting. President Abraham Lincoln was a friend with Theodore Roosevelt’s parents. As a youngster at his grandfather’s house, young six-year-old “Teedie” (as he was called), witnessed Lincoln’s coffin procession along New York City’s Broadway. Lincoln was TR’s presidential hero. Fittingly, these two venerated chief executives earned their destiny to be memorialized in stone, side by side on Mount Rushmore, representing two presidents unified in character and moral leadership. The man who was known in the Badlands as “Hell Roaring Bill Jones” was actually named “Patrick McCue”. He had come from Ireland where, apparently, he had become embroiled in an argument with an uncle. The argument quickly deteriorated into an altercation and in very short order the unfortunate uncle had been battered senseless. Whether or not he ever woke from his slumbers is unclear but “Bill” quickly adopted his new name and packed for the New World. Margaret Barr Roberts was an Irish immigrant who moved to the United States when she was around 11 years old. Her life was one of travel and tragedy.